Creative Marketing Concepts is a full-service promotional marketing agency with a global reach. CMC only offers premium promotional merchandise and delivers the freshest, highest quality branded solutions. Being a full-service they provide storage and fulfillment, print and direct mail and graphic design. With that said they required a custom software application to manage all their multiple jobs and projects. Creative Marketing Concepts and dystrick’s UX, design and development teams worked together to draft flow charts and mock ups on how this custom management system would function. 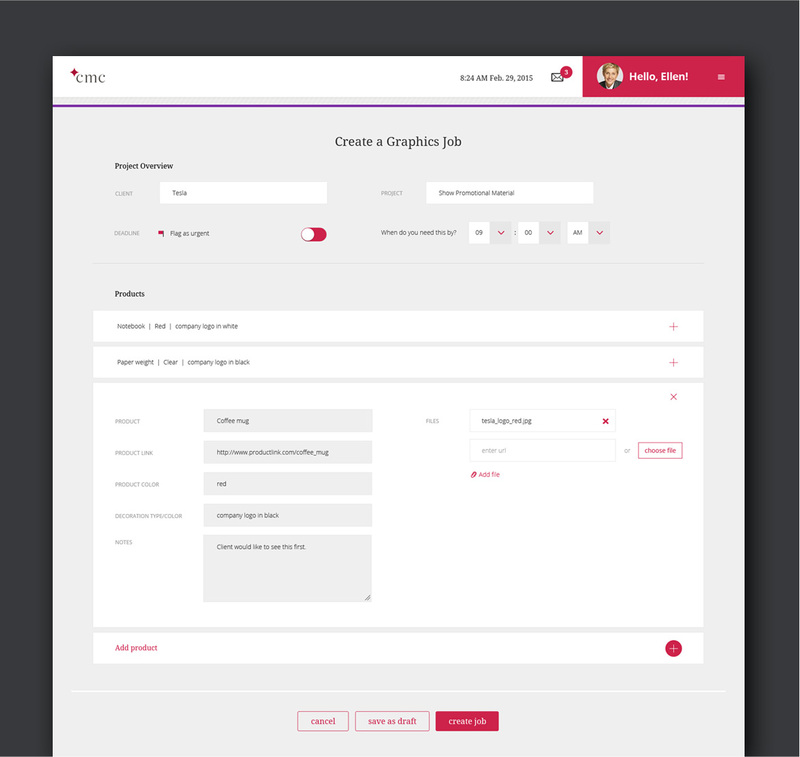 After all the dots were connected and flow charts were drafted, dystrick designed and developed a Jobs Management System to connect sales orders with graphic design services, accounting and fulfillment, all in one software management application. Please contact us if you’d like more information. Login restricted site with individual users for each designer and salesperson. Their user type will determine what functionality is available to them. Designers will be able to see a list of available jobs. Clicking a job will bring up the details page, listing all of the information for the job. They can click a button to claim the job. When they do, they will be presented with a form to enter an estimated delivery date/time. Once they submit the form an email will be sent to the salesperson notifying them which designer claimed the job and the estimated delivery date. 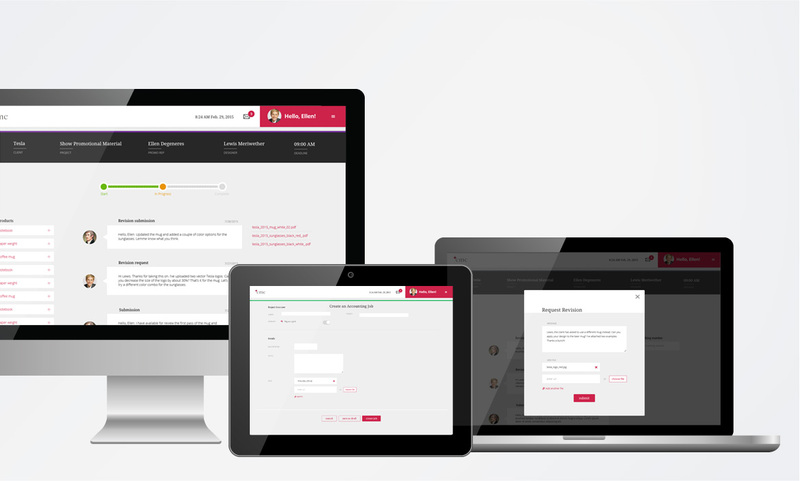 Salespersons will be able to post a job to the system. 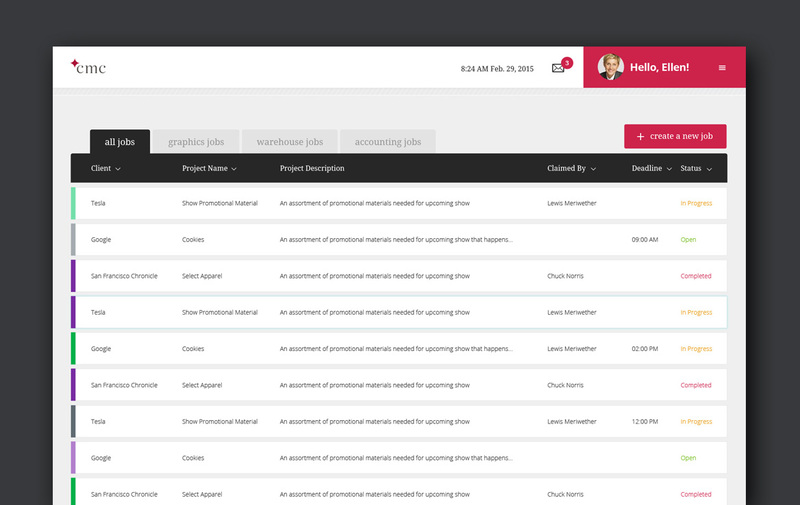 Each job will have a name, client name, description/notes, and deadline. They will also be able to upload files that are related to the job. For example the clients logo, or an example layout. The job can be saved as draft or available.